"You will never know what will be happening tommorow." 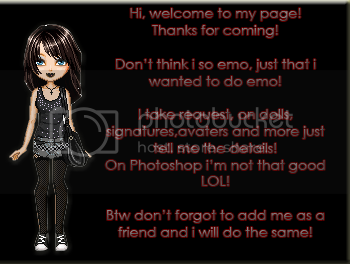 Hi My Name is Glendys, i use Photoshop CS2 to make my graphics! MY AVATAR IS NOT MADE BY PHOTOSHOP CS2! See You again BYE BYE!! Login or register to add Glendys <3 as your friend! Please do not copy 'Late Night Bite.' As I made it up and it's not my intention for you to steal it.